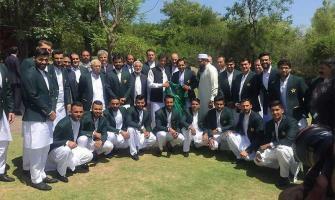 The PM spent an hour imparting advice to the cricket team. He told the team members about his cricketing experience. Urdu Point has all the latest sports news. Sports news Pakistan and international sports news are available. Urdu Point gives you all the latest sports news about cricket, hockey and football. If you are searching for the sports latest news, Pakistan sports news, and sports news cricket go for Urdu Point. All the breaking sports news, live sports news and Pakistan sports news found here. Urdu Point gives much news about cricket Pakistan, football Pakistan and hockey Pakistan. During the live cricket matches, get live cricket scores, and live streaming of cricket matches on Urdu Point. People search PTV sports news or PTV sports live to get the sports updates. But now you can go for Urdu Point to get all the search results about live cricket matches, live sports and live sports news. PSL news is famous now days. Everyone is so passionate about the PSL. PSL 1 and PSL 2 were amazing. Now expectations are high for the PSL 2019. People have chosen their cricket teams for the PSL 2019. All the cricket lovers are anxiously waiting for the PSL 2019. Urdu Point gives you all the breaking news about PSL 2019 and latest news about the teams of PSL 2019. To watch PSL live go for Urdu Point. Live news of PSL, PSL live updates, PSL live scoreboard, PSL 2019 schedule and PSL breaking news will be available on Urdu Point. You can get all the updates about sports news Pakistan. We provide you all the Pakistan sports news. Sports news about cricket games and football games are available. You can read all types of Pakistani sports news on Urdu Point. People who are fond of cricket games, hockey games and football games can read all sports updates on Urdu Point. If you are searching for cricket news in Urdu, football news in Urdu you can visit Urdu Point. In sports news we provide you top 5 sports news headlines, sports news cricket today and sports news today football. Sports football and sports cricket are also available. Sports updates about international sports news and international football news can also be searched. Urdu Point gives you sports news about Pakistan cricket and Indian cricket. Indian sports news are also available. All sports updates about Indian cricket and cricket news India are searched here. Sports news about hockey and cricket are specified on this page. ICC news about cricket matches and updates about cricket schedule found on Urdu Point. Urdu Point gives latest sports news about FIFA and ICC. To get ICC updates and FIFA updates visit Urdu Point. India Pakistan cricket matches are of great importance for Pakistani cricket and Indian cricket. So Urdu Point updates you about all the India Pakistan cricket matches. Cricket news Pakistan and latest Indian cricket news are best available here. Urdu Point provides you latest news about cricket news India and cricket news live. If you are looking for today cricket news, cricket news Pakistan, latest cricket news and latest Indian cricket news then you must go to Urdu Point. All the search results about pak news in Urdu, pak cricket latest news and news Urdu live are available at Urdu Point. If you want to read sports news India or Indian cricket news, you do not need to search Indian channel because all types of Indian sports news especially Indian cricket news or Indian hockey news are available on Urdu Point. On Urdu Point you can also read international news in English. Now if you want to read international news in English, pak news in Urdu, Indian cricket news and pak cricket news then you must visit Urdu Point.